Today's Kickstarter book is Yeti Leaves Home, a children's book on a Yeti leaving home by by Jennifer Campbell & Troy Harris. 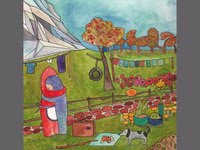 Yeti Leaves Home” is a self-published, hand-illustrated storybook. It is a book for kids, adult versions of kids, and parents to read to their kids. At some point in our lives, the place and people we grew up with are not ours to call home anymore. “Yeti Leaves Home” tells the tale of one young Yeti's travels, as he sets out to make a new home for himself. The book also relates to those moments in children’s lives when the act of growing up requires their independence and confidence. Join Yeti through his many trials and triumphs and share the joy of all the friends he meets along the way. Will Yeti find a place to call his own? Why do you need my pledge? Donations for this project will be put towards the printing costs of the book. $4000 of the Kickstarter funds raised will go towards a beautiful, full-color, hardbound, square format book printed on high-quality matte paper. The remainder of the budget will go towards production, packaging and shipping of the rewards to our supporters! The book is halfway done! The original illustrations from the book will be exhibited at Practical Art Gallery in Phoenix, Arizona for the month of May. It is our goal to have the book printed in time for the opening reception on Friday May 11th 2012.